Charlie Puth has one of the most amazing voices that the music fraternity would have heard. His soft sound is a perfect fit for romantic, soul songs or gospels. While I am not a great music enthusiast, I happened to come across the lines of One Call Away from his album called Nine Track Mind. The album in itself attracted mixed reactions from critics and fans alike but it hit the top 40 of the charts in America. Putting the song and its other aspects aside, the lyrics and especially the two lines are scripted into a fine tune. The lines do remind of some aspects that we find on the football pitch, from some players and it is easily relatable for teams that are dependent on a single player. But are there players that this could relate to? ailing to win anything with the national team, the repercussions for the poor performances from the national team often come on Leo’s shoulders. But putting that aside, there is a well-known fact about Argentina’s rivalry with Brazil. The two nations are always trying to tear each other apart on the pitch. The presence of the diminutive man hasn’t been a pleasing sight for the Brazilians. His stunning dribbling finish from outside the box ended up right into the top corner when Brazil lost 4-3 to their rivals in a friendly. 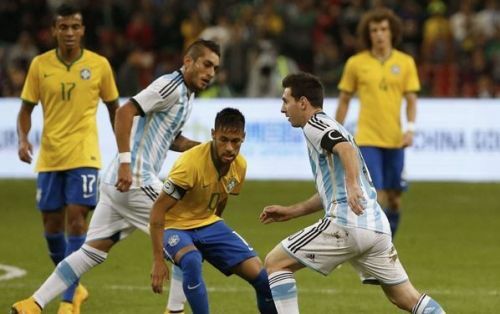 Being an Argentine, Messi should develop a natural hate for Brazil and it is understandable. But Lionel Messi’s career has been widely influenced by the country. It is in this country that he had his best ever World Cup performance. It is this country that the Barcelona scouts visited before moving in to see a little boy at Newell’s Old Boys. How are Charlie Puth, Lionel Messi and Brazil connected? Well, the two lines at the top are perfectly relatable to Lionel Messi and his telepathy with Brazilian players. He has played with a lot of Brazilians at Barcelona and he has been helpful to them and got some help back alike. When Lionel started his Barcelona career, their lead player was a Brazilian. Sporting a huge smile on his face and loved by every person who loves football. The person actually is called Ronaldinho Gaucho, a person whom even the Real Madrid ultras gave a standing ovation, despite him destroying their team. 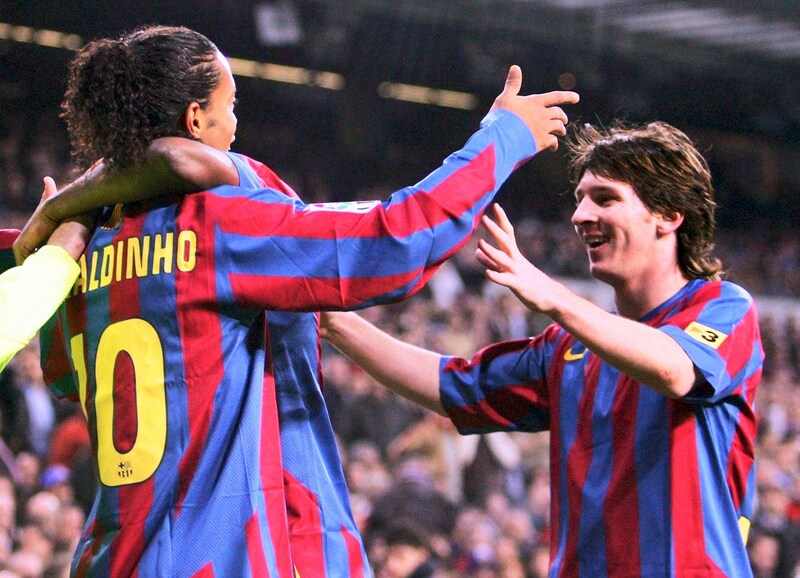 Messi and Ronaldinho’s connection was something special. To Ronaldinho, he was just guiding a young kid, showing him the way to glory. The kid was a more than quick learner though. The first goal that the kid scored came off an assist by the smiling assassin. A beautifully chipped ball over the keeper and Lionel Messi scored his first goal for FC Barcelona. Following the goal, he jumped on the back of the Brazilian and waved his hands. The two lived on the same street as told by Ronaldinho himself and they were good friends off the pitch. People do think that Ronaldinho being a Brazilian and not disciplined about the game was not a good influence for Lionel. But Lionel Messi, being a shy kid was shone the limelight by Ronaldinho. Even while scoring his first hattrick, it was Ronaldinho’s shot that Leo blasted off into the net. Also, it was Ronaldinho’s assist that he took past Ramos and Casillas to cap off his first hat-trick. Even while tearing it apart at Stamford Bridge, Leo was under the watchful eyes of the Brazilian. Lionel has been wearing the same no 10 shirt that Ronaldinho left at Barcelona. Ronaldinho has even adviced Barcelona to retire the jersey once Leo leaves. Ronaldinho was only the first Brazilian with whom Lionel shared a good relationship with. Ronaldinho was more of a mentor to Lionel Messi. Although Juliano Belleti, Edmilson, Maxwell and Adriano all have played for Barcelona, Messi’s next big partnership with a Brazilian was with Daniel Alves. Alves joined Barcelona in 2008 after Ronaldinho left. Daniel Alves and Lionel Messi have been the best of friends. Alves still always tips Lionel Messi as the best player in the world. Their understanding was something else, whenever Alves drove through the right flank, he knew when Leo wanted the ball and when he didn’t. The two have got together to destroy many oppositions and interestingly, Alves is Messi’s best creator for goals. In fact, Dani Alves had assisted Messi a staggering 42 times when he left Barcelona which was more than Andres Iniesta’s 33 assists to Leo. Dani Alves had no problems in admitting that he was a secondary player. But still just like Dani says and I quote. Dani Alves and Lionel Messi have won 3 UCL titles together and their right wing combinations are a huge part of it. They would play neat one-twos, show a clean player of heels, and pull the strings for creating mesmeric plays. Even when they warm up, it is great to see. You won’t get tired of the smiles that both of them exchange and when Leo scores a goal, Dani would rush to bury Leo under himself. Two great friends off the pitch and on it. A few months back Dani even posted a random photo with Lionel Messi on Instagram. It goes to speak volumes on their friendship. Even before Dani Alves left, Messi had his next Brazilian partner. This time Lionel had to play the role different to the previous ones. He wasn’t a student now and he had to continue the role of a friend with that of being a mentor. When Neymar arrived at Barcelona, he was a raw talent, new to European football and he needed to be molded into a great player. Lionel Messi’s influence on Neymar was showing brightly as Neymar adjusted into the Barcelona squad with utmost ease. His good relationship with Lionel Messi helped Barca on the pitch. Messi gave several penalties to Neymar even after being the lead penalty taker for Barcelona. Neymar and Messi combined very well in the final third and following Luis Suarez’s arrival, the three turned out to be the deadliest trio in Europe. 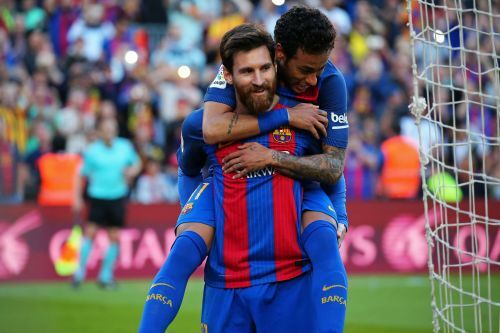 Neymar and Messi’s brilliant combination moves and teamwork was visible in the El Clasico that ended 4-3. It was Neymar driving through the wings and into the box and Messi was in the middle or behind Neymar. The game against Bayern Munich was a specimen of Neymar and Messi’s combination, finished by Luis Suarez’s finishing. The two performed so well that in 2015, both Messi and Neymar, made it to the Ballon D Or Top 3. Messi was always protective towards Neymar. Arguing with the referee, every time Neymar grunted in pain following a tackle. He was ready to take on the backlash of the fans, he got into talk with Valencia fans when Neymar was hit by a water bottle thrown by the fans. Messi was a real teacher who protected his student. Following Neymar’s departure, there was no Brazilian in the squad and Leo was left with Iniesta and Busquets. But yet again, the Barcelona board brought in a Brazilian, this time from China. Paulinho Alcantara’s signing raised a lot of eyebrows. The big physical midfielder was nowhere near what Barcelona’s profile demands. He was slow and poor on the turn. But even an under par player like him felt at ease playing with Messi. His communication with Messi continued in the same way that it was with Alves and Neymar. Paulinho was good at powering off defenders and finishing and Lionel supplied him with everything he needed to get the goals. 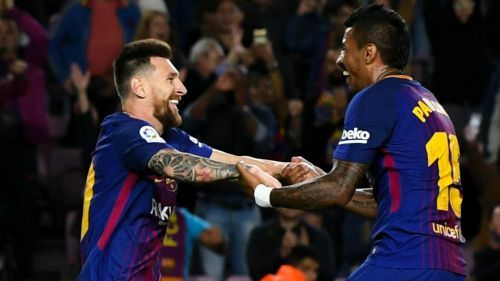 Eventually Paulinho found his tempo at Barcelona and scored 9 goals in La Liga. Paulinho was very good at attacking Messi’s through balls and finished two or three of them. In the 3-0 El Clasico win, Paulinho had two clear chances denied by Navas. Both created by Lionel Messi. And now Paulinho has gone back to his former team for double the salary. Messi made Paulinho look that good. That is the uncanny telepathy, Messi has with Brazilians. 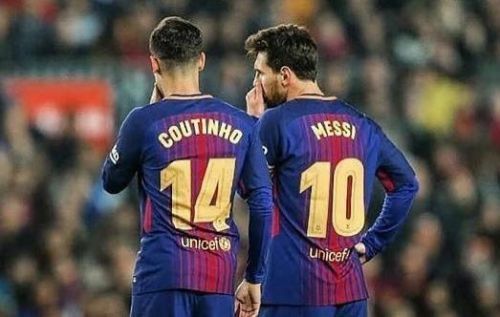 Even now Messi has Coutinho and Arthur with him. Both players are raw talents. Arthur is seeing Europe for the first time and Messi has to make him feel at ease. They combined together in the midfield for the little time Arthur played with Messi when substituted. Coutinho is raw in the sense that Barcelona needs him to play in Iniesta’s role. Messi has been good at dropping in deep and he has to work with Coutinho to make him adapt to the deeper role where Barcelona needs Coutinho to operate. There is no doubt that Lionel will be friendly with Arthur and Coutinho. Brazil and Argentina might be two rivals. But Argentina’s greatest ever football has played some amazing combination football with some of the best Brazilian footballers, rivalries aside. Messi was tutored by a Brazilian during his early days, he had a great Brazilian right back as his best friend and now he is the mentor. He mentored Neymar and now will no doubt do the same for Coutinho and Arthur. Charlie Puth’s lines just describe what Messi said to Neymar and what he will say to Coutinho and Arthur now, only Messi says it silently. Messi and his Brazilian love story. Lionel Messi News: "My son asked me, why do they crucify you in Argentina?"